PCB-GCODE is specifically designed to covert an Eagle PCB design into GCODE for isolation routing. It is written and maintained by John Johnson. Of course, there are a lot of ‘sub steps’. Download PCB-GCODE from the downloads section of the forum. 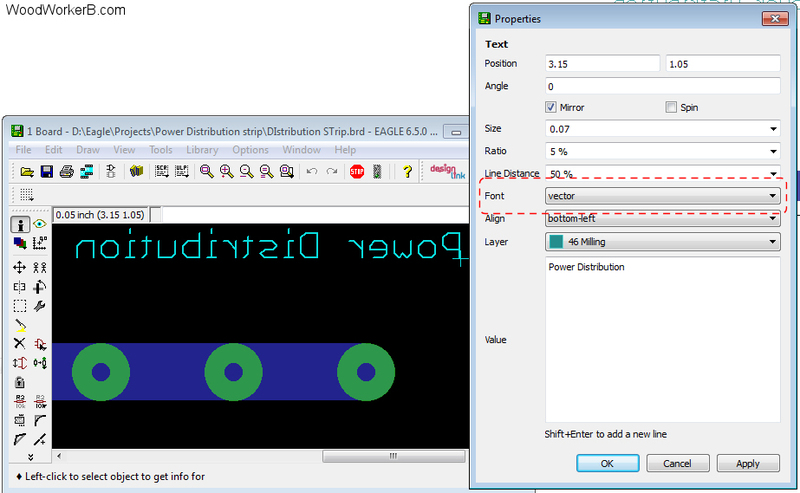 This is a super-handy feature of PCB-GCODE. The challenge is that the component designs in Eagle have a massive range/array of hole sizes, so that a single board can have 20-50 different diameters of holes. This is simply not practical. Not just the drill inventory, but the number of tool changes would make you crazy. The Drill Rack feature allows you to define the drill diameters you have available and the range of diameters for which a specific drill diameter can be substituted. Here is my low-tech Drill Rack, populated based on my needs and experience. In the table above, it is CRITICAL to use TABs between all the elements, NOT spaces. To make the above chart work in WordPress, I needed to use spaces. I have found two ways to include text on your PC board. Engraving and milling. I have been using the milling option, but I prefer engraving. The two approaches look completely different. Milling text involves putting the text (as vector font) on either the top or bottom of the PC board – along with the traces. The lettering will be “isolation milled” exactly like traces. About half the time I manage to machine away most of the text.